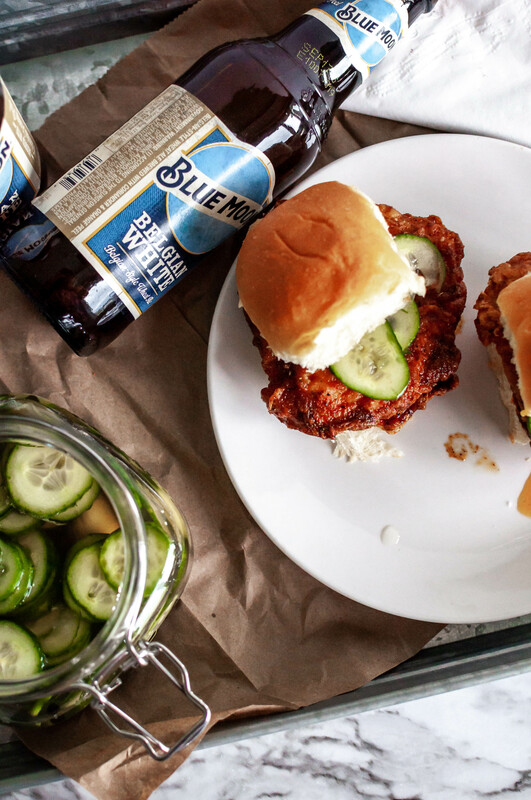 Hot Chicken Sliders with homemade quick pickles are just what you need for game day. Or Monday. They are crispy and super spicy with a fresh bite from those homemade pickles. Just what game day ordered. I made these hot chicken sliders MONTHS ago and I’m pretty sure I’ve dreamed about them every night since. 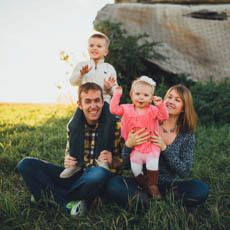 They are THAT good. Sorry for holding off on you for so long but I knew these spicy sliders would be game day perfection. And somehow fall is almost upon us and football has descended upon my life. We all know I’m solidly just there for the food. So we’ve got to make it good, right?! Fried chicken is my ultimate “if one food didn’t have calories for the rest of your life, death bed” food. You know those questions people ask on social media. Fried chicken is always my answer. Spicy fried chicken on bread with pickles just puts it completely over the edge of perfection for me. Literally three of my very favorite foods in one. If you aren’t into spicy food you might want to just move along because these little sliders pack a spicy punch. Or just skip the sauce we’ll talk about in a few. Please don’t be intimated by all the ingredients and steps in this recipe, it really isn’t as difficult as it may seem. Because we’re making sliders, you only need a skillet for frying and they cook up fast since they are small pieces. And I promise the end result is completely worth it. The breading for the chicken is packed full of spices for some major flavor but isn’t hot spicy. That part comes in next. The sauce or coating the chicken gets after frying, that stuff is hot. If you’ve never had hot chicken, let me give you a little rundown. The chicken is fried of course then it gets tossed in a spicy sauce. It’s spicy in two ways, as in spices from the cabinet and also hot, spicy. To make it, several spices including cayenne are mixed together with brown sugar to give a nice sweet and spicy vibe. The brown sugar helps balance out all the cayenne pepper and provides some relief so it isn’t unbearable spicy. Once the chicken is fried, you mix in some of the hot oil that you were just using. I know that sounds completely artery clogging but you’ve got to live every once and awhile. Then you brush on the sauce and completely coat the fried chicken. Now let’s talk about the equally delicious little condiment that tops these spicy little guys. We love pickles in our house and making them is fun and simple. And homemade pickles don’t have to take days or weeks to make. This little quick pickle that we’re making today is more of a vinegary cucumber that adds a great crunch and acidity that balances out the spicy, crispy chicken. The pickles only take a few hours to make and that includes the time to chill them so the actual hands on work is super minimal. You just need to make sure to plan a little extra time in between making them and eating so they can cool in the refrigerator. You can certainly use store-bought pickles but I really love the crisp freshness the homemade version provides. Either way, you get a spicy fried chicken sandwich so you are winning at life. To wrap this thing up. There’s soft, sweet bread. There’s crispy, spicy chicken. There’s fresh, crunchy, vinegary pickles. What more do you need in life? For the pickles: bring all pickle ingredients but the cucumbers and fresh dill to a boil until the sugar and salt dissolves. Pour into a bowl and allow to come to room temperature. Place cucumber slices and dill sprigs in a large jar or two medium jars and pour liquid over them. Seal and let sit for 45 minutes at room temperature. At this point they are ready to eat or refrigerate. For the chicken: in a shallow dish (like a pie plate or cake pan) combine all dredge ingredients. In another dish, whisk together egg, milk and hot sauce. In a heat proof dish, combine all the coating ingredients and set aside. Heat oil in a large skillet over medium heat (about 350 degrees F). Set a cooling rack over a plate or baking sheet and set aside. Coat the chicken pieces in the flour dredge. Dunk the chicken in the egg wash until fully coated. Then coat in the flour dredge mixture and roll around until coated. Set on a plate until all chicken is coated. Once the oil is preheated, add chicken to the skillet and cook on first side until golden and crispy, 3 to 4 minutes. Flip and cook until second side is crispy. Remove chicken and place on rack. Once all the chicken has cooked, very carefully remove 1/2 cup of the oil and mix it into the coating mixture. Stir well. Brush coating generously over the fried chicken pieces. To serve, spread buns with mayo if desired. Top with a piece of chicken and several pickle slices.